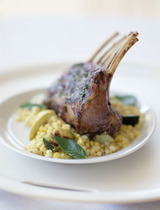 This lamb recipe has a very Greek-style to it. These lamb chops are loaded with tenderness and flavor. Be sure to get the loin chops versus regular lamb chops. Preparation:Combine olive oil, thyme, basil, rosemary, garlic, lemon zest, salt and pepper in a bowl. Dip lamb chops into mixture to coat evenly. Cover chops and refrigerate for at least 30 minutes. Preheat grill. Place lamb chops on grill over a medium high heat. Grill about 5 minutes per side. Chops should be browned on both sides. DirectionsFinely chop nuts and garlic in processor. Add mint leaves and basil and chop finely. Add oil and vinegar and blend until pesto is smooth. Trim any excess fat from leg of lamb, leaving thin layer. Set leg of lamb in large roasting pan. Make several slits in leg of lamb with tip of small sharp knife. Reserve 1/2 cup pesto for vegetables. Spoon some pesto into each slit; rub remainder into leg of lamb. Sprinkle leg of lamb generously with salt and pepper. Let stand 1 hour at room temperature or cover and chill overnight. Preheat oven to 350°F. Roast leg of lamb 45 minutes. Add potatoes to pan and turn to coat in pan juices. Roast 30 minutes. Add carrots and reserved 1/2 cup pesto and turn to coat carrots and potatoes in pesto and pan juices. Sprinkle with salt and pepper. Continue roasting until thermometer inserted into thickest part of leg of lamb registers 140°F. for medium-rare, about 45 minutes longer. (Note: The cooking time will vary depending on whether the leg of lamb bone is in or not, so keep checking with cooking thermometer!) Remove leg of lamb from oven and let stand 15 minutes. Carve leg of lamb into thin slices. Arrange leg of lamb on plates with potatoes and carrots. 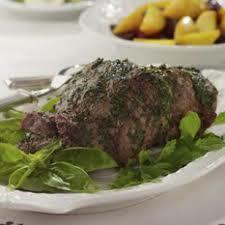 Garnish leg of lamb with fresh mint leaves. This leg of lamb recipe serves 6-8. 1 Heat a small pan over medium heat and add oil, garlic, jalapeño and shallot, and cook for 1 minute, then let cool. 2 Meanwhile, crumble lamb into a large bowl. Evenly scatter salt pork, orange zest and mint over lamb, and season with pepper. Sprinkle the cooled garlic mixture over lamb. Gently mix until just combined, then form into 1¼-inch balls and transfer to a plate or sheet pan. 3 Heat a large cast iron pan over medium to medium high heat. 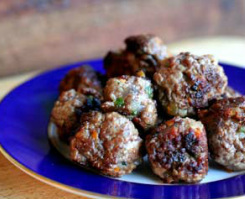 Working in batches if necessary to prevent crowding, brown meatballs on all sides until cooked through, 8 to 10 minutes. Serve warm with toothpicks or skewers with plain yogurt. Note: Meatballs can also be cooked ahead, refrigerated and reheated in the microwave on high for 2 minutes.